The market capitalization of all listed firms on BSE hit a lifetime high of ₹ 156.6 trillion on Monday, compared with the previous peak of ₹ 156.56 trillion, which was reached on 23 January. But while the broad markets have been flat in the past eight months, a select set of stocks have generated immense wealth for investors. As the charts below show, the rally is mainly among large-cap stocks in the finance, information technology and consumer goods sectors. Of course, there are outliers— Reliance Industries Ltd, for instance, has continued to race ahead in value, thanks to the excitement about its telecom venture. But by and large, the rally is selective. Portfolios that include a healthy proportion of these favoured stocks have done well, while others have lagged. And again, with the qualification that there are always exceptions, investors are sticking with so-called quality names. 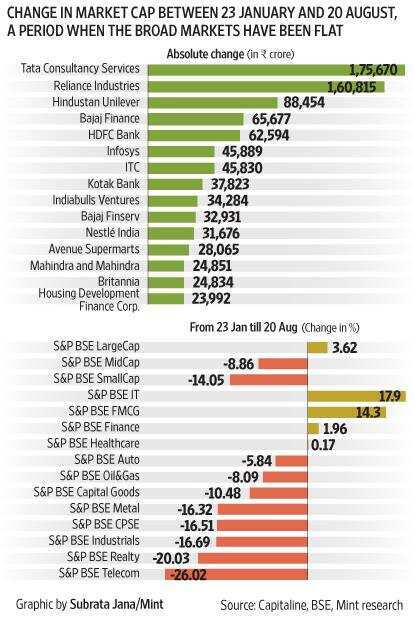 But given a dearth of quality stocks in the country, valuations of these stocks have gone through the roof, and are way ahead of fundamentals.